When you invest in something, or even just buy something from the grocery shelves, it seems that it is already automatic that you would check the details of the product that you are about to buy. For instance, you are about to buy a can of tuna. Even before picking up a can of tuna, you would first scan the shelf for the brand that you would usually prefer. Right after picking up, you would then look for the expiry date and if it’s still far, you would then check if there are dents on the can because it is advised that you shouldn’t buy something that has physical defects because maybe, it already has effects on its contents. If you see no unusual marks on the product, it is then that you would put it in your basket or cart. 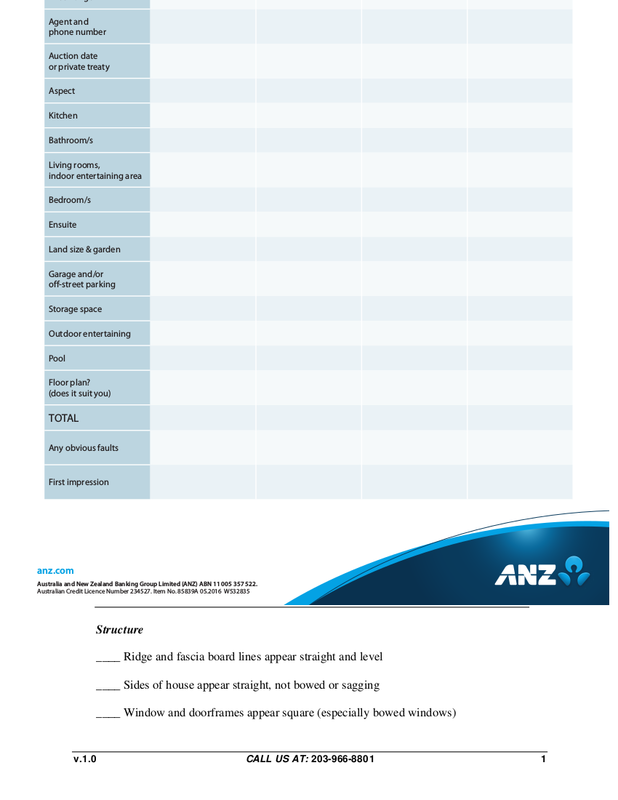 you may also see Inspection Checklist. It is recommended that you first check the product or even the service that we are about to avail even if it comes in cheap, how much more if the product or service that we are to avail is expensive? There comes a time in our lives that we would already be investing in our future. Aside from the financial aspect, we also invest in tangible things like owning a car, a piece of land, or a house. It takes a lot of years in order to come up with enough funds in order to buy those things that is why we would try our best to make sure that the hard-earned money that we are about to spend on something that is going to be of great help and value in the years to come. When the time finally comes that you would be able to buy your own house, you have to make sure that you would purchase one like that of buying a can of tuna. This is when home inspection comes to play. 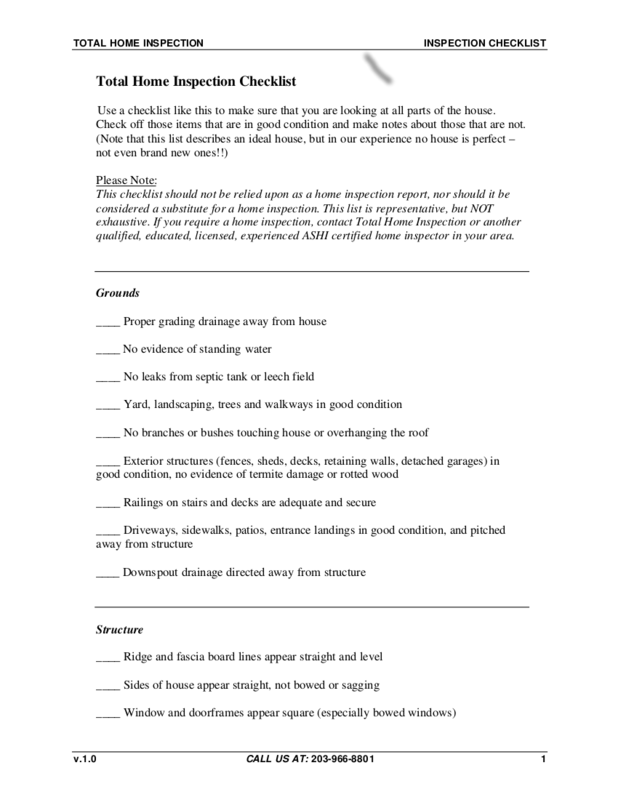 Before you should even sign a contract that would seal your purchase, the first thing you should keep in mind is to conduct a home inspection because chances are, when you have already sealed the deal, there’s no more turning back. You have to make sure that the house you are going to purchase is something that you would not regret because you have made sure that it is complete or almost complete. You have to make sure that the house you are going to purchase has the potential of becoming your home for your entire lifetime. 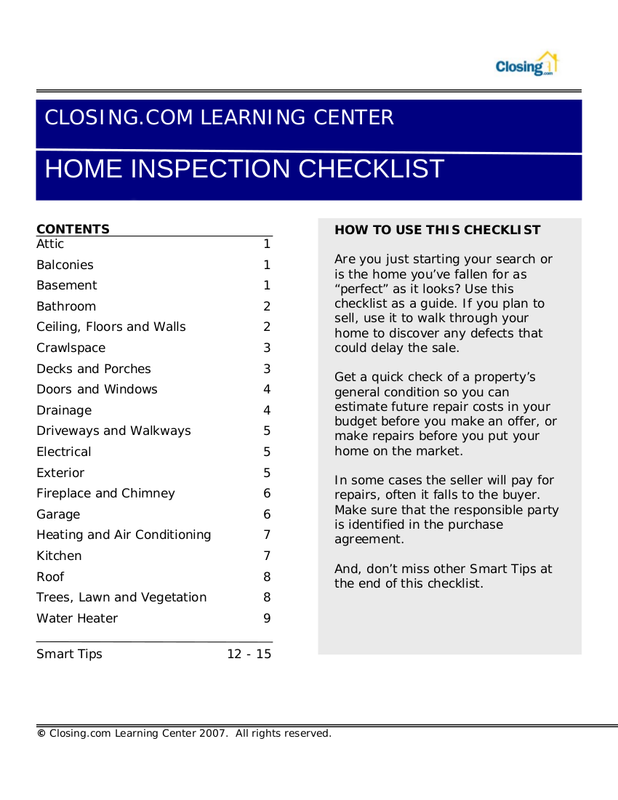 One way of making sure that you have successfully inspected your future home is by making use of a checklist that would keep track of all the things you should check and inspect since there is a big chance that there are some nooks and crannies that you would not be able to check and inspect on if you do not keep track of it. 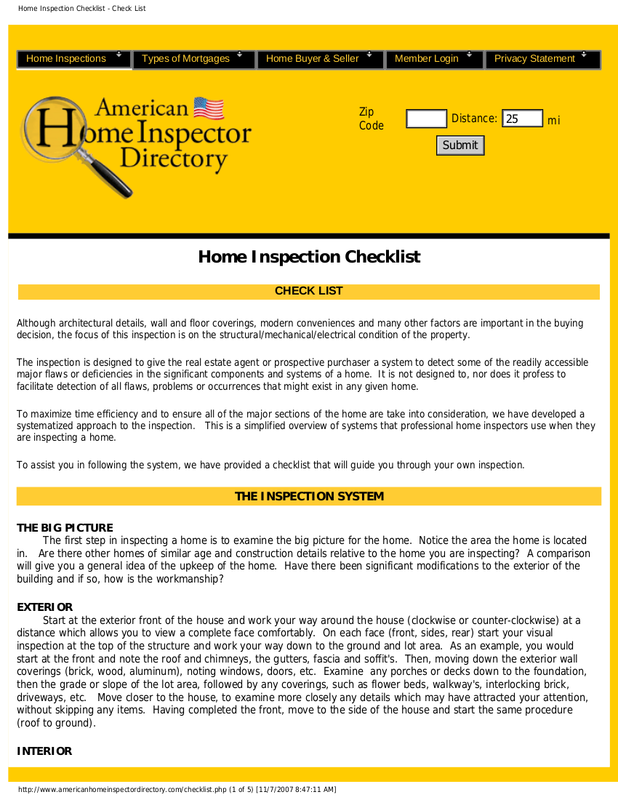 Whether you are doing your own home inspection or you are going to do it with a professional, here are thirteen examples of home inspection checklist that can be used as your guide. 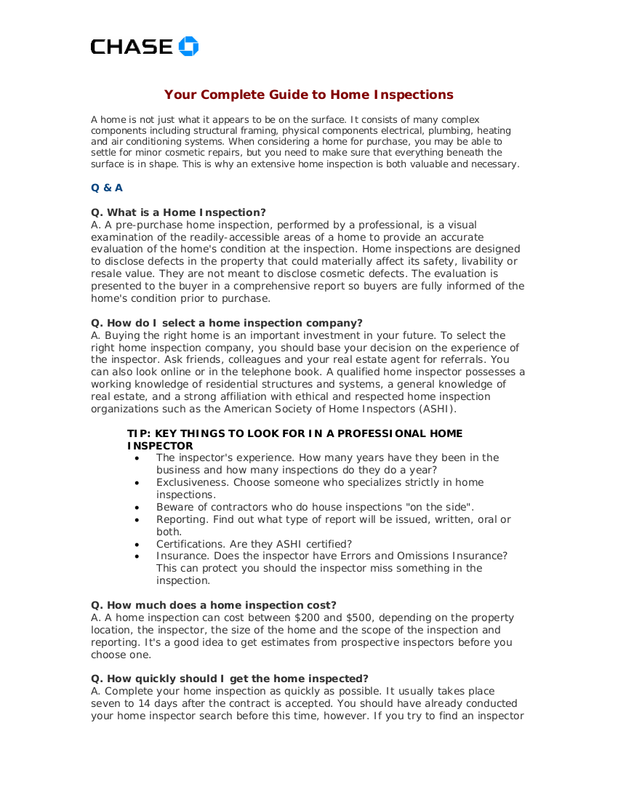 While doing home inspections, the major aspects that you should check and inspect on are the safety, operation, and the condition of the house that includes the things that are already inside of the house that you are going to buy. 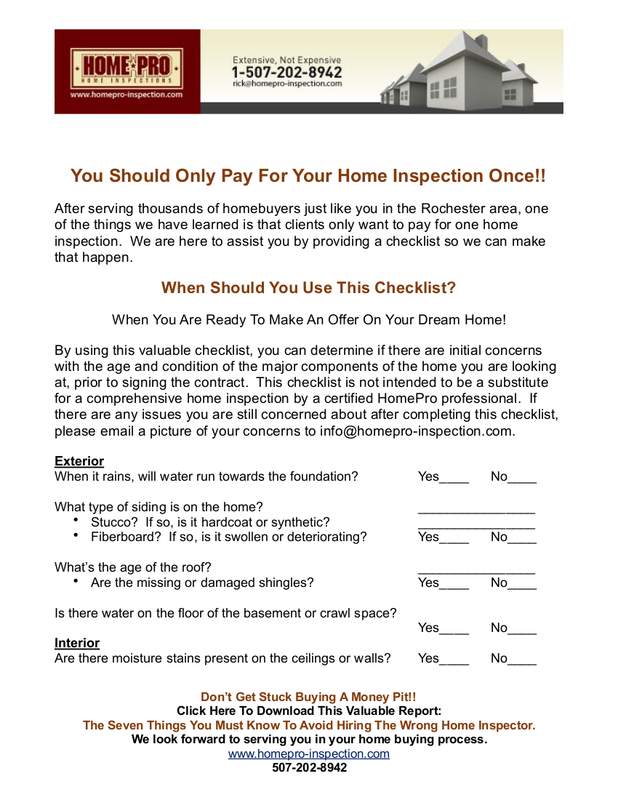 The aspects that you should be inspecting are undeniably a lot to remember but with the help of a nearly or complete home inspection checklist, you can be assured that every single penny you spent on your future home will be worth it and you will be able to purchase it without regrets. The interior aspect of your home is everything that is found and can be seen inside. 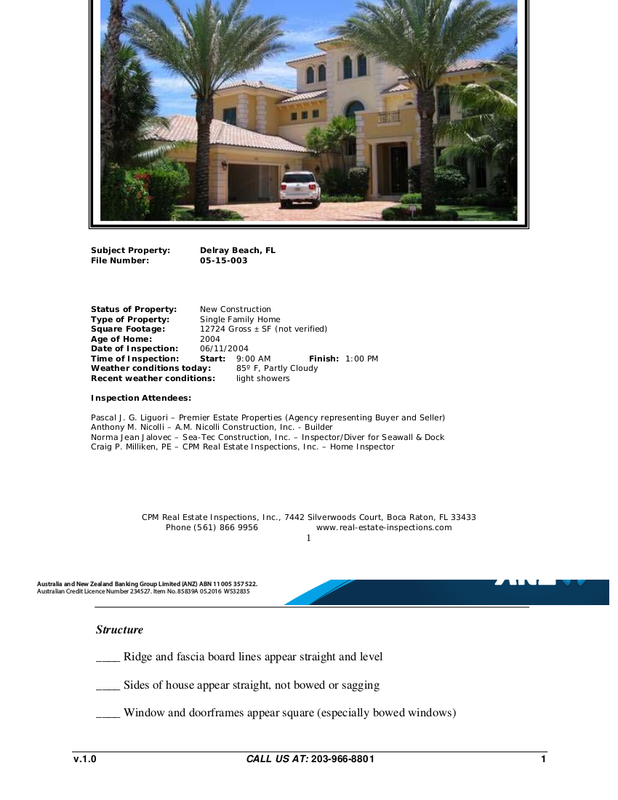 This includes checking if the walls, ceiling, and floor are in good shape and do not have any cracks or dents, that the the steps, stairways, and railings have been molded and shaped correctly that it is not too high or too low, that the countertops and cabinets do not have any issues like termites, that the doors and windows are a perfect fit and are of quality that it can withstand any kind of weather without deforming, that the garage doors do not get stuck midway, and that the readily installed appliances are brand new and of great quality as well. The exterior aspect of your home is everything that is found and can be seen outside. This includes that the wall coverings or finishings are done without any cracks, that the decks, balconies, stoops, steps, porches, and railing have a sturdy foundation, that the garage and carport can fit the size of regular cars, that the walkways, patios, and driveways are done correctly and that it can withstand any weather, and that the roof, gutters, chimneys, and downspouts are of quality and are not already worn out. Plumbing, as defined by Merriam Webster, could be the apparatus concerned in the distribution and use of water in a building, or an internal system that resembles plumbing; especially that consists of conduits or channels for conveying fluids. You have to check up on the fixtures and faucets to see if it has been installed correctly and that water comes out of it clean, same goes for the water heater or cooler. You would also have to check up on the drain, waste, and vent system to see if something can go out of it without any interferences of any sort, same goes for the sump pumps and sewage ejectors. 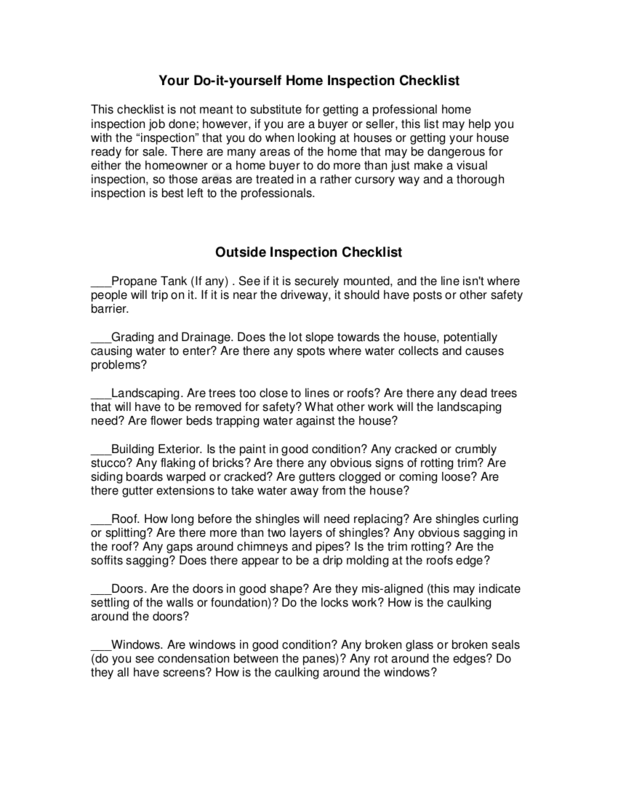 This is one aspect of a house inspection that is important because anything that goes wrong with this could be hazardous and any faulty parts would pose any danger, such as a fire, that is why it is really imperative that you should check. 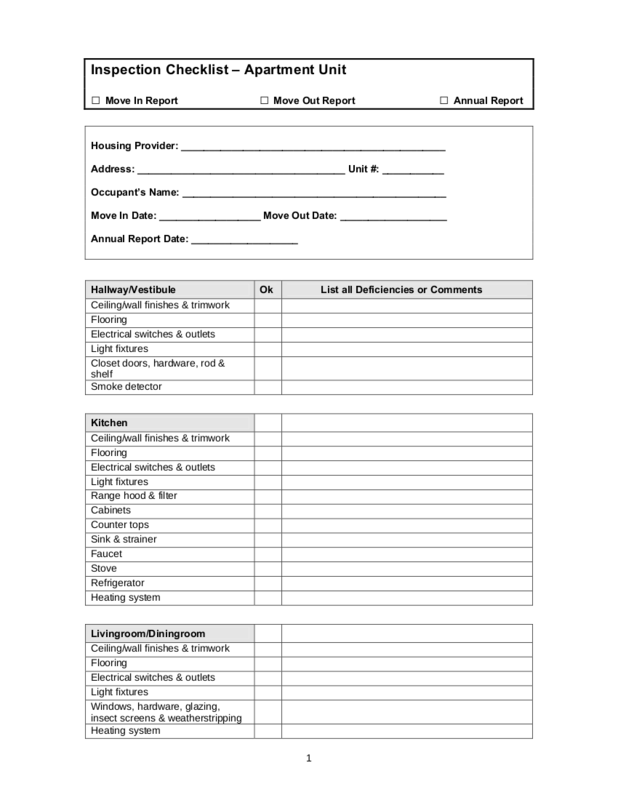 In this, you have to check the following: service drops, service-entrance conductors, cables, and raceways, service equipment and main disconnect, service grounding, interior components of service panels and subpanels, conductors, overcurrent protection devices, light fixtures, switches, and receptacles, and the circuit interrupters. The Heating, Ventilation, and Cooling System or the HVAC of your house can also be hazardous if it is neglected or missed out. Your home’s HVAC System includes the access panels, thermostats, heating and cooling equipment, fireplaces, and stoves, vent systems, exhaust systems, flues, and chimneys, insulation and vapor retarders in unfinished spaces, and the distribution systems. 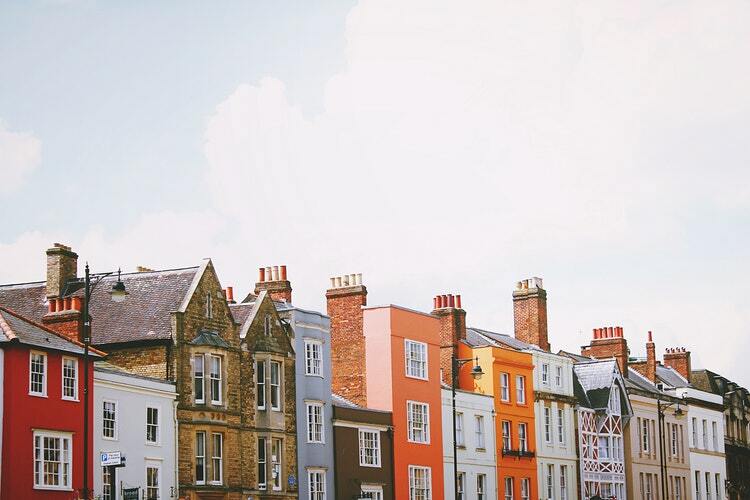 Your home’s foundation could be the make or break of the entire house because without making sure that it is sturdy and of good quality, your house could literally go down in pieces. This includes your home’s foundation in general, the floor structure, and the wall structure, ceiling structure, and the structure of your roof. 1. Peel up the carpet to see the condition of the floor that the carpet is covering. There could be cracks and dents in the foundation that could be risky. 2. Check out in the bathroom or the kitchen to see if there are molds or rust on pipes. You cannot risk your water system if you missed out those parts. 3. Move pieces of furniture and even potted plants to see if the floor that those are placed on do not have cracks and dents. 4. Check the wirings that are found in the basement or in the ceiling. 6. Try lighting a fire in the fireplace to see if it’s already safe to light a fire in it. 7. 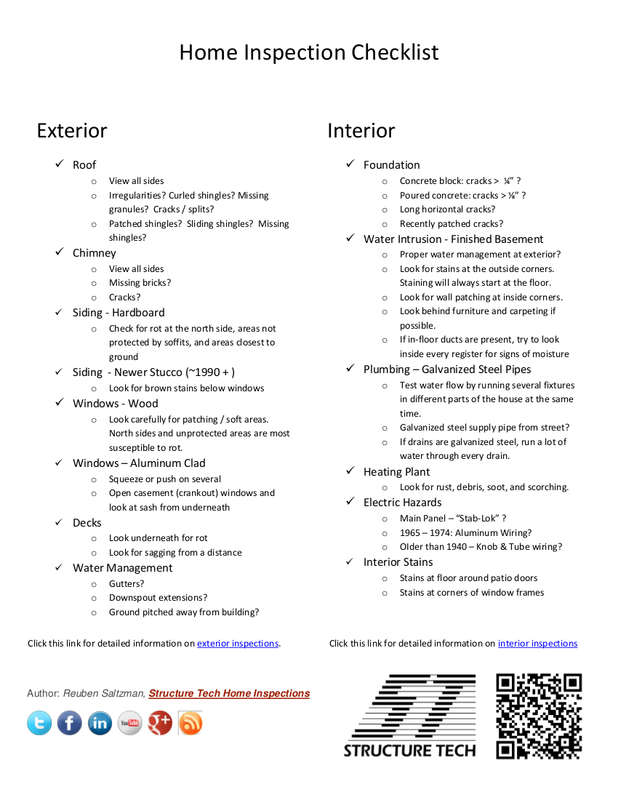 Check the lifespans of every single appliance or any installations. 8. 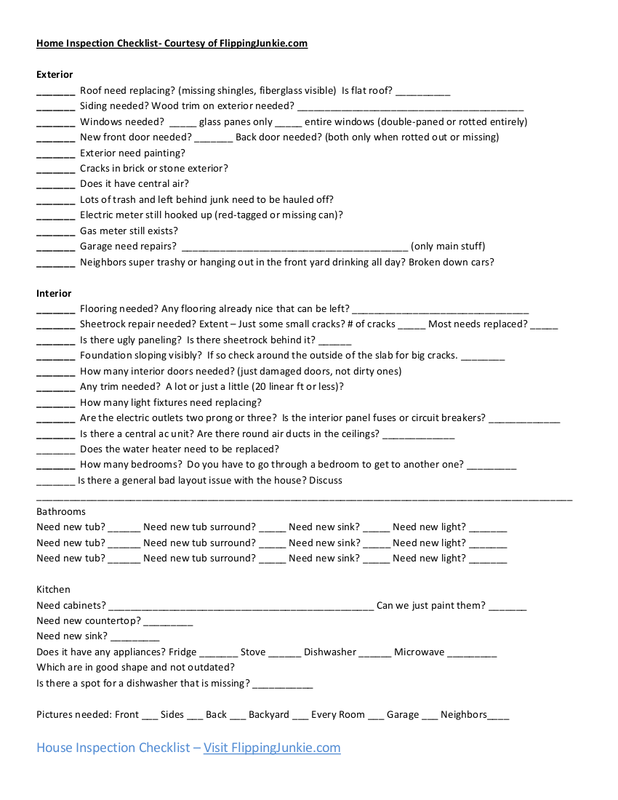 Test every appliance or installations to see if every single one of it is working or do not cause any problems that can be hazardous. 9. Try to estimate the possible cost of your monthly bills particularly on the utility and electricity. 10. Check the lawn irrigation systems you have or the underground storage tanks or even your water tanks. 11. If some part of the house is made out of wood, check out for termite infestation or any kind of wood-destroying insects. 12. Check and test out every single smoke detectors, light switches, or any installations that are not really that permanent. 13. 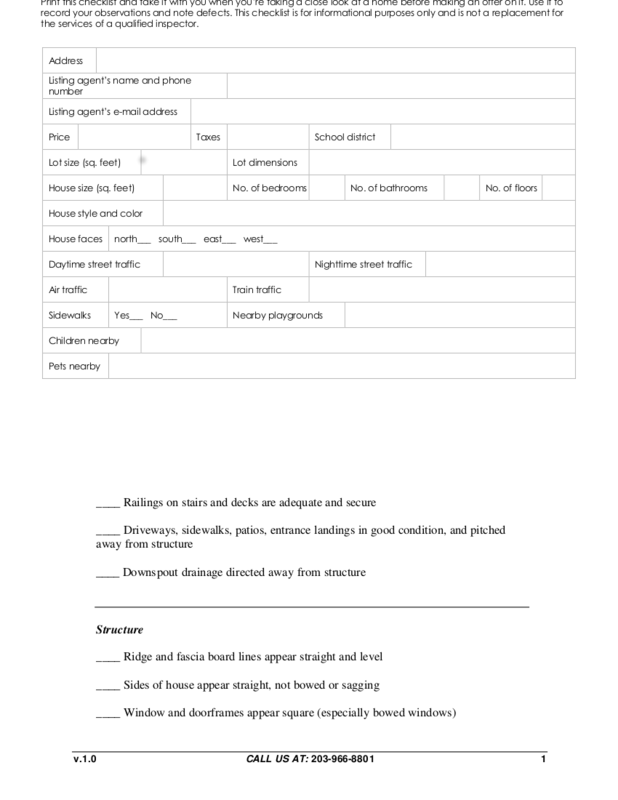 Aside from inspecting the physical aspects of the house, see to it if you have already checked the surrounding of the house to see if the neighborhood is safe to live in, if there are establishments such as stores, restaurants, among others. 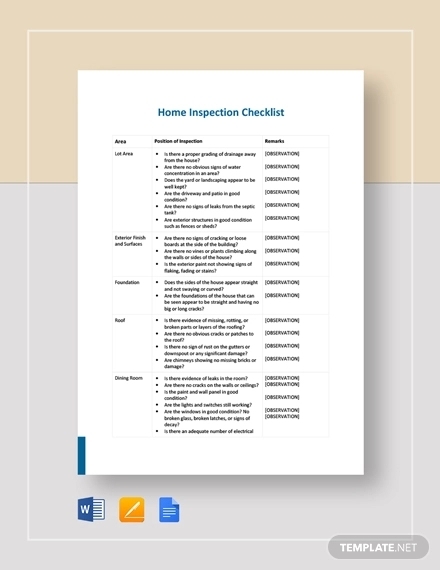 Sure, after reading the ideal contents of your home inspection checklist, you might feel overwhelmed with all the things you should inspect and check out for. You would also have to think that every single cent you are about to spend on is going to the right home so that there would be no regrets in the future of dwelling in your home. It is in inspecting your future home that you would feel assured and even experience fun even if the mere thought of doing the house inspection could be exhausting. It is, in fact, an open opportunity where you would know what you are getting yourselves into. The house you are about to purchase can somehow define your future; it would enable you to see whether that house is a home potential.